Ikeda T, Atarashi H, Inoue H, Uchiyama S, Kitazono T, Yamashita T, Shimizu W, Kamouchi M, Kaikita K, Fukuda K, Origasa H, Sakuma I, Saku K, Okumura Y, Nakamura Y, Morimoto H, Matsumoto N, Tsuchida A, Ako J, Sugishita N, Shimizu S, Shimokawa H, the EXPAND Investigators. The EXPAND Study: study design and baseline patient characteristics -Evaluation of effectiveness and safety of Xa inhibitor, rivaroxaban for the prevention of stroke and systemic embolism in a nationwide cohort of Japanese patients diagnosed as non-valvular atrial fibrillation-. Tohoku J Exp Med. 240:259-268,2016. Miura M, Sakata Y, Miyata S, Shiba N, Takahashi J, Nochioka K, Takada T, Saga C, Shinozaki T, Sugi M, Nakagawa M, Sekiguchi N, Komaru T, Kato A, Fukuchi M, Nozaki E, Hiramoto T, Inoue K, Goto T, Ohe M, Tamaki K, Ibayashi S, Ishide N, Maruyama Y, Tsuji I, Shimokawa H; SUPPORT Trial Investigators. Influence of left ventricular ejection fraction on the effects of supplemental use of angiotensin receptor blocker olmesartan in hypertensive patients with heart failure. Circ J. 80:2155-2164,2016. Nochioka K, Biering-Sorensen T, Hansen KW, Sorensen R, Pedersen S, Jorgensen PG, Allan Iversen A, Shimokawa H, Jeger R, Kaiser C, Pfisterer M, Galatius S, on behalf of the BASKET-PROVE Investigators. Long-term outcome in patients with rheumatologic disorders after percutaneous coronary intervention: A BASKET-PROVE Substudy. Eur Heart J. Acute Cardiovasc Care. 6:778-786,2017. Sato H, Miura M, Yaoita N, Yamamoto S, Tatebe S, Aoki T, Satoh K, Ota H, Takase K, Sugimura K, Shimokawa H. Pulmonary Arterial Hypertension Associated with Congenital Portosystemic Shunts Treated with Transcatheter Embolization and Pulmonary Vasodilators. Intern Med. 55：2429-2432,2016. Tadaki S, Sakata Y, Miura Y, Miyata S, Asakura M, Shimada K, Yamamoto T, Fukumoto Y, Kadokami T, Yasuda S, Miura T, Ando S, Yano M, Kitakaze M, Daida H, Shimokawa H. Prognostic impacts of metabolic syndrome in patients with chronic heart failure -A multicenter prospective cohort study- Circ J. 80:677-688,2016. Miura M, Sakata Y, Miyata S, Nochioka K, Takada T, Tadaki S, Ushigome R, Yamauchi T, Takahashi J, Shimokawa H. Prognostic impact of subclinical microalbuminuria in patients with chronic heart failure -A report from the CHART-2 Study- Circ J. 78:2890-2898,2014. Sakata Y, Miyata S, Nochioka K, Miura M, Takada T, Tadaki S, Takahashi J, Shimokawa H. Gender differences in clinical characteristics, treatment and long-term outcome in patients with stage C/D heart failure in Japan -A report from the CHART-2 Study- Circ J. 78:428-435,2014. Sakata Y, Nochioka K, Miura M, Takada T, Tadaki S, Miyata S, Shiba N, Shimokawa H, for the SUPPORT Trial Investigators. Supplemental benefit of an angiotensin receptor blocker in hypertensive patients with stable heart failure using olmesartan (SUPPORT) trial-Rationale and design. J Cardiol. 62:31-36,2013. Nakayama M, Osaki S, Shimokawa H. Validation of mortality risk stratification models for cardiovascular disease. Am J Cardiol. 108:391-396,2011. Shiba N, Nochioka K, Miura M, Kouno H, Shimokawa H. Trend of westernization of etiology and clinical characteristics of heart failure patients in Japan--first report from the CHART-2 study. Circ J. 75:823-833,2011. Nochioka K, Shiba N, Kohno H, Miura M, Shimokawa H. Both high and low body mass indexes are prognostic risks in japanese patients with chronic heart failure - implications from the CHART Study - J Card Fail. 16:880-887,2010. Shiba N, Matsuki M, Takahashi J, Tada T, Watanabe J, Shimokawa H. Prognostic importance of chronic kidney disease in Japanese patients with chronic heart failure. Circ J. 72(2):173-178,2008 Feb.
Shiba N, Nochioka K, Kohno H, Matsuki M, Takahashi J, Tada T, Kagaya Y, Shimokawa H. Emerging problems of heart failure practice in Japanese women. -Lessons from the CHART Study-. Circ J. 72:2009-2014,2008. Shiba N, Shimokawa H. Chronic heart failure in Japan: Implications of the CHART studies. Vasc Health Risk Manag. 4:103-113,2008. Tada T, Shiba N, Watanabe J, Kagaya Y, Shinozaki T, Shirato K, Shimokawa H. Prognostic value of anemia in predicting sudden death of patients with diastolic heart failure. Int'l J Cardiol. 128:419-421,2008. Shirato K, Shiba N, Shimokawa H. Chronic Heart Failure Analysis and Registry in the Tohoku District: the CHART study. Nippon Rinsho. 65 Suppl 4:74-78,2007. Watanabe J, Shinozaki T, Shiba N, Fukahori K, Koseki Y, Karibe A, Sakuma M, Miura M, Kagaya Y, Shirato K. Accumulation of risk markers predicts the incidence of sudden death in patients with chronic heart failure. Eur J Heart Fail. 8:237-242,2006. Shiba N, Watanabe J, Shinozaki T, Koseki Y, Sakuma M, Kagaya Y, Shirato K. Poor prognosis of Japanese patients with chronic heart failure following myocardial infarction--comparison with nonischemic cardiomyopathy. Circ J. 69:143-149,2005. Watanabe J, Shiba N, Shinozaki T, Koseki Y, Karibe A, Komaru T, Miura M, Fukuchi M, Fukahori K, Sakuma M, Kagaya Y, Shirato K. Prognostic value of plasma brain natriuretic peptide combined with left ventricular dimensions in predicting sudden death of patients with chronic heart failure. J Card Fail. 11:50-55,2005. Shiba N, Watanabe J, Shinozaki T, Koseki Y, Sakuma M, Kagaya Y, Shirato K; CHART Investigators. 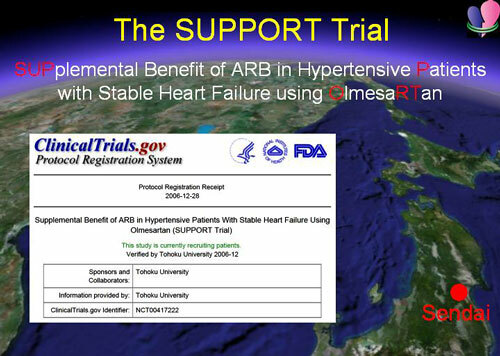 Analysis of chronic heart failure registry in the Tohoku district: third year follow-up. Circ J. 68:427-434,2004.